Last January when I began the journey to find my 'perfect home' I did a couple things to help me focus on my ultimate goal and to keep me on track as I pursued it. The first thing I did was to create a blog called "Every Day Do One Thing". Thanks to blogger, setting it up took five minutes. The purpose was to create a journal that encouraged me to do one thing every day toward meeting my goal. By creating it in a public forum, my intention was to hold myself accountable to make and record my progress as well as to share it with others who might be traveling the same road. The second thing I did was to create a vision board. Anyone who has watched Oprah, read The Secret, or has even a passing interest in goal setting has probably heard of vision boards. They are much like child's play: take a stack of magazines, cut out pictures that capture your interest or illustrate your goal, cut them out and glue them on poster board. As simple as it sounds the outcome is remarkable and you'll be surprised at how what seems like a random group of pictures will come together to perfectly express your heart's desire or burning passion. 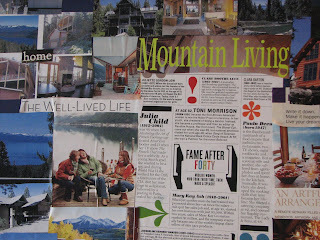 As you can see from the vision board I created at the start of my house hunt, my focus was on finding that perfect mountain community. So I've got lots of pictures of homes in the mountains. Now, I will admit that when I first created the vision board, I was skeptical about its effectiveness. Yes, I liked what I'd created, but on those bleak days when it seemed that I wasn't making any headway in choosing where to move, I'd look at the vision board and think it was simply a waste of time. However, once I'd finally found my perfect hometown and the temporary home that I've rented while I go through the job hunting process, I took a closer look at the vision board. Among the pictures I could see that where I'd ended up was exactly where I'd imagined as portrayed in the pictures I'd chosen. So what's the key? 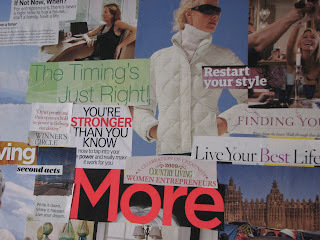 I don't think creating a vision board is a magic bullet that creates miracles out of thin air. In fact, my house hunt didn't really begin bear fruit until I finally left home and made three trips out west to look at actual locations. Intentions are wonderful, but they require action on our part for the 'manifestation' to occur. I believe the 'magic' of the vision board is that it really helps us to focus our attention on our goals or to even mine our unconscious for creative fodder. Which is why I've now created a second vision board as I move into the second stage of my transition to a 'new life' out west. I've found the place and a temporary home, now I've got to focus on employment. My goal is to find not just a job, but a career that I love. 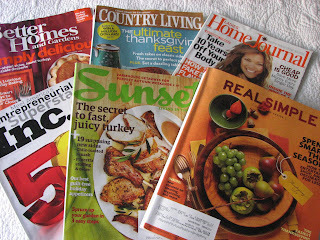 So last weekend I pulled out a stack of magazines from the recycle pile and started cutting. Once again I was skeptical about how the random words and pictures were going to express the salad of thoughts in my mind, however, once I started arranging them on the board, things started coming together into a cohesive whole that truly express where I am now and where I want to go, as well as providing the inspiration I'll need when my tendency toward anxiety threatens to overwhelm my best intentions. If you've tried a vision board, I'd love to hear about your results! So does this vision board illustrate your wish to work at a first class hotel/ski lodge? Congrats to you. It's wonderful and brave of you to go after your dreams. Many people can't or won't figure out what they want, much less go after it. So kudos to you. Thanks for sharing your vision boards. I've never made one but I can absolutely see that they work. Great post. I'm glad a vision board helped you gain some perspective and focus on your goals. I've done one for my writing goals and it has been so helpful. You're right, a vision board can focus your intentions, but you still have to act...and you certainly are! A girl after my own heart! I love vision boards! And yes, they work. That's because it's "all in your head," i.e. you're wiring your brain by focusing on your vision board. Yay! I never have come across a site such as the one you have here with so much refreshing interests. The remarks are very interesting. It's always refreshing to see an issue like this take a different approach. I like how you wrote this article up. Very nice indeed. I would love to see more things like this being published. It seems like it gets harder and harder to come across subjects like this one here. I never realized this stuff was so popular. Some of the remarks people are leaving here are really interesting to read. I'll have to look more into this as it is rather intriguing. I really dont understand a lot of what most people are saying here but it is sure interesting to read. Some of them are very intriguing from your guests. interesting topic. I like this sort of stuff. Can't tell you how much I like this article. Great work. I really liked this post. Good job to the person that wrote this. I don't think I understand this too much. Guess i should read it again and try to find out. I really enjoyed reading your site, and it looks wonderful.